Your 20s are a time to just have fun and try to figure out what you want to do with your life, right? Well, maybe not. While you certainly can and should have fun and explore the wealth of possibilities your 20s present you, scientific, sociological, and psychological studies alike point to your 20s as being a particularly critical time in your life to focus on learning, improving yourself, getting ahead in your career, and even finding a future mate. Your decisions and actions during this time could have a lifelong impact on everything from your earning power to your personality. That’s a pretty big deal and something that shouldn’t be taken lightly. Even if you’re struggling to cope with the challenges posed by the economic downturn, your first few post-college years have the potential to be some of the most defining and important years of your life. That’s no reason to stress if you’re feeling a bit off track, but here we highlight some of the reasons why you shouldn’t just drift through your 20s aimlessly; they’re actually a pretty critical part of who you are and who you’ll become. Much of your wage growth happens in the first few years of your career.Dr. Meg Jay, author of a new book called The Defining Decade, says that a significant portion of your lifetime earning potential happens in your 20s, making it critical to get out there and get working. She estimates that as much as two-thirds of lifetime wage growth happens during just the first 10 years of a career. Once you hit your 40s, salaries will peak or plateau, making it hard or impossible to catch up if you only start getting serious about your career in your 30s. Many of your most significant life events will take place in your 20s. Think your 20s won’t count for much in the story of your life? More than likely, that won’t be true. Dr. Jay also states in her book that 80% of life’s most significant events take place by age 35. That means that you’ll either be doing those significant things in your 20s, or setting the stage for them to happen in your early 30s. It might sound extreme, but it makes sense if you think about it. The average age for marriage is 28, buying a first home is 34, and having a first child is 25: all in the 20s or early 30s. That doesn’t even account for big steps like getting your first job, buying a car, moving in with a partner, or getting promoted, all of which are also likely to happen within the same time frame. You’re very likely to meet your future spouse or partner in your 20s.While career is important in your 20s, that doesn’t mean you should neglect relationships. While marriage has increasingly been pushed back later and later, especially in the wake of the economic crisis, the Pew Research Center found that 62% of college-educated individuals are married or have been married by 30 (even if those marriages just barely squeak in, as the average age for first marriage in the U.S. is 28). Even those who aren’t married in their 20s will likely be paired up: studies suggest that more than half of women will live with a partner by age 30 and that an equal percentage of all individuals will be married, dating, or living with a lifelong partner by 30. Your 20s are when you learn to have healthy relationships. Not everyone will meet their special someone before turning 30, but that doesn’t mean that the 20s aren’t still pivotal years for developing relationship skills. Relationships in your 20s should edge away from the low or no-criteria hookups of college, and you should focus on figuring out both what they want from a partner and how to be a good partner themselves. Otherwise, bad relationship after bad relationship could leave you feeling depressed and carrying a lot of emotional baggage into your 30s. Even worse, staying in a relationship out of convenience rather than pushing for something truly satisfying could lead to an ill-fated marriage and eventual divorce. It’s the time to plan for future children (if you want them).If you’ve just graduated from college, the last thing you’re probably thinking about is becoming a parent. Yet your 20s are the ideal time to start thinking about when and with whom you’d like to start a family. Some studies suggest female fertility peaks at 28, while others have found that the decline starts much earlier. Either way, it’s clear that fertility drops significantly by age 35 and even more dramatically by 40. Waiting too long to start a family could mean not being able to start one at all or racking up huge medical bills for fertility treatments. It isn’t just women who have to take this into consideration; male fertility sees a significant decline after 40, too, and even strong fertility for men won’t do much to help a decline in fertility in a female partner. Your 20-something brain is still developing.The frontal lobe, the part of the brain responsible for processing time, anticipating consequences, assessing probability, and generally addressing problems that don’t have clear answers, doesn’t fully mature until you hit your mid 20s. This doesn’t mean that you shouldn’t just hang out and wait for it to grow up, however. The brain’s not-quite-developed state makes it ripe for forming new habits and learning new things. It’s the ideal time to bulk up your brain and get it firing in the patterns you want it to for the rest of your life. Criticism hurts more, but it can help you develop good habits.Because your frontal lobe isn’t always fully developed in your early 20s, it can be harder to think in ways that aren’t black and white. As a result, negative information, criticism, and rejection often seem to hurt more and feel much more dramatic than they do later in life. This makes your 20s an excellent time to learn to control emotions or find positive outlets to let off steam, whether through meditation, therapy, exercise, or whatever appeals to you. Training your brain to manage these kind of emotional reactions can be a huge asset to you for the rest of your personal and professional life and will become easier both with practice and the maturation of your brain. Your personality is still developing.Your personality is often developing during your 20s, right alongside your brain, sometimes at a more rapid pace during those years than it will for the rest of your life. A study at the University of California found that conscientiousness (being more organized and disciplined) increased more during the 20s than at any other age, perhaps both in response to the development of the frontal lobe and new responsibilities in relationships and at work. Of course, conscientiousness isn’t the only trait that can change, and as 20-somethings move from the sheltered environment of the college campus into the real world, many other traits can (and often do) change as well. The 20s aren’t a time to just think about what you want to do, they’re the time to act on it. Even though many 20-somethings are moving back in with parents, struggling to find work, and are stuck in that dreaded “emerging adulthood” phase, your 20s are not a time to drift aimlessly while you try to figure out your life. Quite the opposite. While you don’t have to have your whole life planned out by 25, you should start taking on jobs, getting education, and engaging in experiences that will help you define what career you want to pursue, where you want to live, and more generally what you want out of life. This process and the things you learn from it will be critical to helping you maintain your career later on in life, so make the most of it. It’s critical to maintain good mental health in your 20s.The average 20-something probably isn’t too worried about his or her mental state, but studies show that the 20s can be a pretty tumultuous time for young brains. Stress from a job hunt, coping with the realities of being on your own, or any of the other numerous transitions that happen in your 20s can be hard on your mental health and can result in depression and anxiety. Even worse, a saddening 12% of suicides are people between 15 and 24 years of age. Drugs and alcohol are a common coping mechanism for stress, but experts caution that that could set the stage for addiction and substance abuse issues, which are common among 20-year-olds. Even those who think they’re not having mental health issues should exercise caution and find people to talk to, get active, and explore ways to reduce stress. It’s the time to get really good at what you do.It should come as no surprise that most of us don’t emerge from college, enter the workforce, and immediately know what to do. It takes time to become good at anything, whether you’re designing buildings or marketing products. That learning process is a fundamental part of your 20s and one that certainly shouldn’t be discounted (even though some of us might like to forget our early on-the-job gaffes). Studies show that it takes roughly 10,000 hours of practice to master something, which in the working world translates to about five years. With solid on-the-job learning under your belt in your 20s, you should enter your 30s pretty good at whatever it is you decide to do. Learning is easier in your 20s than it will be in your 30s and beyond.While it’s possible to learn new things at any time in your life, biologically, the younger you are, the better primed for learning your brain will be. Some evidence suggests that your 20s might actually be the prime time to learn. A study done in Israel compared learning in people who were 8, 12, and 21. The young adults outscored the other groups, learning new skills faster and more accurately. 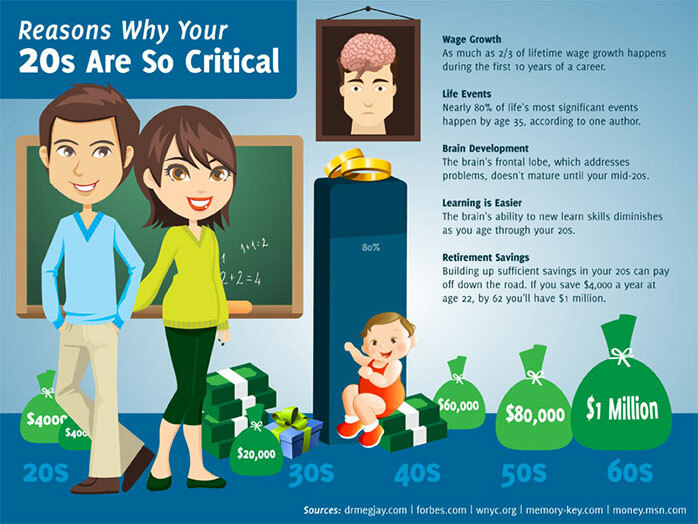 Other studies have shown that the ability to learn that’s so amazing in the teens and early 20s rapidly diminishes as you move through your 20s, making those early years after graduation a sweet spot for gaining skills and knowledge that might be harder to get to stick later on. It’s the time to set the stage for good lifelong habits.Because your young brain is primed for learning and is still developing, your 20s are the ideal time to start training yourself (and your brain) to form good habits. From getting up early, to working out, to eating right, to being patient, it will never be easier to alter your brain to think and act in positive ways than it will be in your 20s. Don’t waste that opportunity. Your 20s are the ideal time to start saving for retirement. If you’ve only just entered the working world, you probably feel like you have a long time before you have to think about retirement. That’s not really the case, however. While you probably won’t end up destitute if you start saving later, building up a sufficient savings in your 20s can pay off big later on down the road. Just how big? If you start saving $4,000 a year at age 22, by 62 (assuming an 8% rate of return) you’ll end up with $1 million. If you wait until you’re 32, you’d have to put in $8,800 a year to reach that same amount. There isn’t as much time as you think there is. As anyone out of their 20s can tell you, those years absolutely zoom past. You might think you have all the time in the world to figure things out or get started on your career, but every year you waste costs you money, makes your retirement less secure, sets back your career, and can even have a big impact on your personal life. That’s not a call to freak out, just a reminder that your 20s won’t be around forever and you can only spend so much time figuring things out before you need to act. In your 20s, nearly every avenue is open, and you have nothing to lose.The 20s are a great time to start a business, take a risk, or head back to school to pursue your passion. So little in your life is set in stone, (even your brain isn’t done developing), so it’s the ideal time to experiment with what works and what doesn’t. Without a huge savings, a family, or an established career, you have little to lose by taking risks and trying things out you probably wouldn’t be open to later in life. Go for it, but make sure you learn, grow, and get something out of it in the process. You’ll build up networks personally and professionally. Your 20s are an ideal time to start meeting new people, branching out, and taking advantage of connections you have in life, whether personal or professional. Psychologists like Dr. Meg Jay encourage 20-somethings to break out of their urban tribes (support groups of youngsters between college and marriage) and meet new people, especially those they might not usually seek out. By embracing a phenomenon she calls “weak ties,” those in their 20s can use tenuous connections (a friend of a friend, say) to land a great job or an opportunity to do things you’ve always dreamed about. These interactions, she claims, are more likely to transform your life than those with friends and family. You can redefine your family. While not every 20-something wants to get away from a dysfunctional family (some may feel closer to their families than ever), many find themselves redefining who is central to their lives. For some, this may mean growing importance put on friendships; for others, the formation of their own families through marriage and child-rearing. As an adult, you have the power to decide who you want in your life and how much of an influence they have on you, a process that often starts becoming more prevalent in your mid to late 20s. Financial decisions in your 20s will impact your finances for life. We’ve already discussed the importance of saving for retirement in your 20s, but what about other financial decisions? It turns out that those can be pretty important, too. It doesn’t matter if you’re making $10,000 a year or $100,000 a year when you graduate from college, so long as you start building strong money management skills in those post-grad years. Saving can be hard and investing can be daunting, but the lessons you learn from these experiences (even your missteps) can help set the stage for a strong financial future. Your 20s are when you learn to be an adult. Facts and figures aside, your 20s are the time in your life when you learn how to be an adult. You’ll get a job, make friends, pay bills, take care of yourself, have relationships, and generally gain an understanding of what those previous two decades were trying to teach you about life. More importantly, you will make mistakes and have failures, but you’ll learn how to learn from them and how to pick yourself back up and get on with life. Your 20s are the ideal time to enjoy life but also to figure out just what you want yours to be about (even if that changes later on down the line) and to define yourself beyond your family, your school, or your upbringing. That’s key to having a happy, healthy life, so don’t let your 20s pass you by without putting some thought into what you really want to get out of them.